SAN JOSE, Calif. (AP) - Cristian Espinoza had a goal and an assist, and San Jose earned its first points of the season. Shea Salinas opened the scoring in the 15th minute, making a run through the center of the 6-yard box to finish Espinoza's cross. 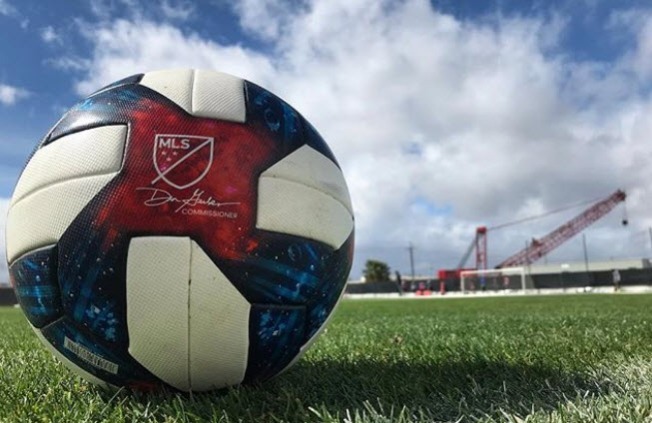 The Earthquakes (1-4-0) led 2-0 in the 33rd minute when Danny Hoesen pounced on a loose ball on the left side of the 6-yard box and poked it into the roof of the net. San Jose snapped a five-game losing streak that stretched back to last season. WASHINGTON (AP) - Diego Rossi scored three times for his first career MLS hat trick, and Los Angeles FC snapped D.C. United's 15-game regular-season unbeaten streak with a 4-0 win on Saturday. Carlos Vela scored his MLS-leading seventh goal of the season in the 15th minute, ripping a left footer from the top of the box to give LAFC (5-0-1) the lead. Rossi, from near midfield, played a ball wide to Vela on the left side and then sprinted into the area where he slipped a left-footer inside the near post in the 27th. Rossi first-timed a bending side-netter about five minutes later to make it 3-0 at halftime and capped the scoring in the 76th minute. Vela and Rossi have more goals (13) this season than any other MLS team. LAFC has won three in a row and has outscored its opponents 19-5 this season. D.C. United (3-1-1) played a man down after Wayne Rooney, who came in among the MLS leaders this season in goals (four) and assists (three), was shown a straight red card in the 52nd for a dangerous tackle on Rossi. It was United's worst loss since a 4-0 decision against the Portland Timbers on Oct. 15, 2017. SEATTLE (AP) - Nicolas Lodeiro scored in the 18th minute, and Seattle extended its club-record start. The Sounders (4-0-1) almost grabbed the lead when Brad Smith's cross to Will Bruin was barely out of his reach at the right post. But the ball stayed in play, and Cristian Roldan gained control on the right side of the penalty area. Roldan floated a high cross toward the left side, just over the head of Salt Lake defender Marco Silva. It landed at Lodeiro's feet, and he tucked it into the left corner past goalkeeper Nick Rimando. Until this year, Seattle had never been unbeaten through its first five games. The team's previous best record through five was 3-2-0 during its inaugural 2009 season. Stefan Frei collected his second straight shutout and third of the season. Salt Lake (1-4-1) lost its fourth straight. COLUMBUS, Ohio (AP) - Josh Williams scored, and the Crew moved alone into first place in the Eastern Conference. TORONTO (AP) - Jonathan Osorio scored in the 76th minute, lifting Toronto FC to the tie against the Fire. Jozy Altidore scored for Toronto in the first half and set up Osorio's tying score. Positioned on the flank near the Chicago penalty box, the burly striker twisted and turned Jeremiah Gutjahr before delivering a perfect cross for Osorio to head in. HARRISON, N.J. (AP) - Abu Danladi and Romario Ibarra scored to lead Minnesota United to the victory. Danladi put Minnesota United (3-2-0) in front in the 34th minute with a low finish set up by Angelo Rodriguez's cross. Rodriguez's hold-up play led to a deflection that Romario smashed home with a volley in the 50th minute, giving Minnesota United a 2-0 lead. Cristian Casseres Jr. slotted in a putback to cut the Red Bulls' deficit to one the 70th minute. It was the 19-year-old Venezuelan's first MLS goal. The Red Bulls' Alex Muyl left the game in the 21st minute due to injury. New York (1-3-1) lost its third in a row. ORLANDO, Fla. (AP) - Nani converted a late penalty and finished with two goals and an assist, powering Orlando City to the win. Rapids goalkeeper Tim Howard guessed the wrong way and Nani finished into the right corner to cap the scoring in the 89th minute. The Rapids' Axel Sjoberg conceded the penalty with a hand ball in the area. Chris Mueller tied it at 3 in the 81st minute for Orlando City (2-2-2), settling a pass from Tesho Akindele and finishing with his left foot into the right corner. Kei Kamara gave Colorado a 1-0 lead in the ninth minute, slotting a half-volley home for his 115th MLS goal, moving him past Ante Razov for fifth place on the career goals list. Nicolas Mezquida scored in the 61st minute and Cole Bassett added another in the 71st to give the Rapids (0-4-2) a 3-2 lead. The match was delayed an hour at halftime due to inclement weather. CHESTER, Pa. (AP) - Cory Burke and Alejandro Bedoya scored to rally Philadelphia to its third straight win. Bedoya scored the go-ahead goal in the second minute of stoppage time, settling Ilsinho's pass and cutting back to create space for a low left-footed finish. The Union (3-2-1) had tied it at 1 in the 85th minute when Cory Burke converted a putback off Marco Fabian's blocked penalty shot. Burke drew the penalty against Matt Hedges. Reto Ziegler opened the scoring with a free kick for FC Dallas (3-2-1) in the 10th minute. NEW YORK (AP) - Montreal FC's Evan Bush had four saves for his first shutout of the season. Montreal (2-2-1) played the final 20 minutes a man down after Maximiliano Urruti was shown a straight red card in the 70th minute for a studs-up tackle on Maxime Chanot. New York City FC (0-1-4) has been shut out in back-to-back games and has four goals in five MLS matches this season.